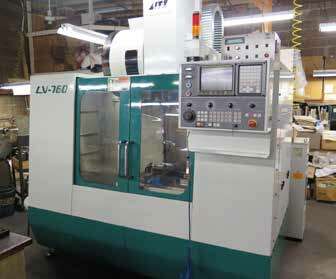 2001 Litz LV-760 CNC Vertical Machining Center s/n V29980047 w/ Fanuc Series 21-M Controls, 24-Station Side Mount ATC, ZF Gearbox, BT-40 Taper Spindle, 8000 RPM, Travels X=30”, Y=15.98”, Z=21.49”, Chip Auger. Mori Seiki SL-15 CNC Turning Center s/n 368 w/ Yasnac Controls, Tool Presetter, 12-Station Turret, 6000 RPM, Hydraulic Tailstock, 1 5/8” Thru Spindle, 6 1⁄2” 3-Jaw Power Chuck, 16C and 5C Collet Noses. LNS Hydrobar Type 6.42-HS-5.2 6-Tube Hydraulic Bar Feeder s/n 30.531 w/ (5)Spindle Liners. Mori Seiki SL-3H CNC Turning Center s/n 5249 w/ Yasnac LX-2 Controls, 12-Station Turret, Hydraulic Tailstock, 40-4000 RPM, Parts Catcher, 10” 3-Jaw Power Chuck, 5C Collet Nose, Riken AD-65 Collet Nos and S20 Collet Pad Adaptor. LNS Super Hydrobar Type 6.65-HS-5.2 2 1⁄2” Cap 6-Tube Hydraulic Bar Feeder s/n 27.879 w/ (6)Spindle Liners. Bridgeport Vertical Mill s/n 52038 w/ 1Hp Motor, 80-2720 RPM, 6-Speeds, Power Feed, 9” x 42” Table. Diamond Horizontal Mill w/ Rusnek Vertical Milling Head, 120-1560 RPM, Cross Slide. South Bend 13” x 42” Lathe s/n 11742TKX14 w/ 40-940 RPM, Inch Threading, Tailstock, Hardened Ways, Steady Rest, KDK Tool Post and Holders. South Bend 13” x 42” Lathe s/n 4295TKL10 w/ 40-940 RPM, Inch Threading, Tailstock, Steady Rest, KDK Tool Post and Holders. (2)Traub A25 Automatic Screw Machines s/n’s 25/7033, 25/5559 w/ 4-Cross Slides, 2-Drilling Stations, Bar Feed. Rockwell mdl. 102 5” x 10” Surface Grinder s/n 102-6272 w/ Magnetic Chuck. Craftsman and Standard Pedestal Grinders. Buffalo Bench Model Drill Press. Electro-Mechanico High Speed Table Model Drill Press. Curtis 5Hp Vertical Air Compressor w/ 80 Gallon Tank. Safety-Kleen and Greymills Parts Washers. Yuasa 4th Axis Rotary Head w/ Yuasa Servo Controller. 16C and 5C Collets Brown & Sharp No.21 and A3 Screw Machine Collets. Ellis 4” 3-Jaw Compound Sine Chuck. Lista Dual 6-Drawer Tooling Cabinet/Work Bench. Insert Mills, Drills, Turning and Boring Tooling w/ Carbide Inserts. Sunnen PG-800-E Honing Gage w/ PG-500-E and PG-300-E Setting Fixtures and 3” Finger Adaptors. Mitutoyo, Starrett and Brown & Sharp OD Mics, Bore Mics, Depth Mics. Torsion Balance 120 Gram Precision Balance Scale.